You might say the day is never really done in consumer technology news. Your workday, however, hopefully draws to a close at some point. This is the Daily Roundup on Engadget, a quick peek back at the top headlines for the past 24 hours -- all handpicked by the editors here at the site. Click on through the break, and enjoy. If you so much as touched a computer in the 1990s, we'd wager that the mere mention of You Don't Know Jack will bring back a flood of memories. Jellyvision's irreverent trivia game has seen a resurgence in popularity over the last few years, with its presence expanding to Facebook, iOS and Android, and the Jack Attack isn't stopping there: beginning June 11th, you can "Screw Your Neighbor" on the OUYA game console. You'll be able to get a trial 11-question episode for free or upgrade to get a full set of 20 games. Cleverly, this version includes a new feature called Party Play which lets up to three additional players compete against you by turning iOS and Android devices into external controllers. 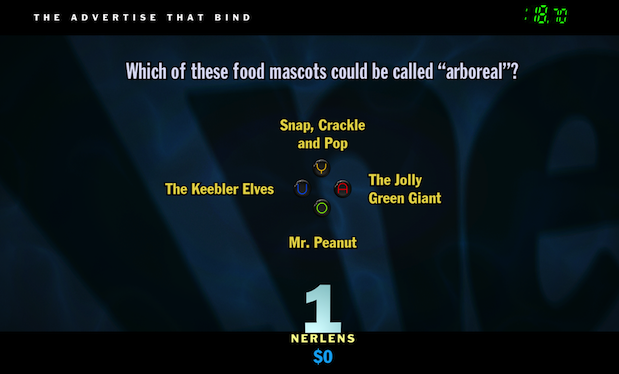 Not a bad addition for OUYA users eager to answer questions like the one you see above (and if you're curious, we're pretty sure the answer is "The Keebler Elves"). Bumblebee, you’re doing it wrong. Or maybe he just got scared and decided to roll into a ball. This vehicular sculpture was actually made by Indonesian artist Ichwan Noor. 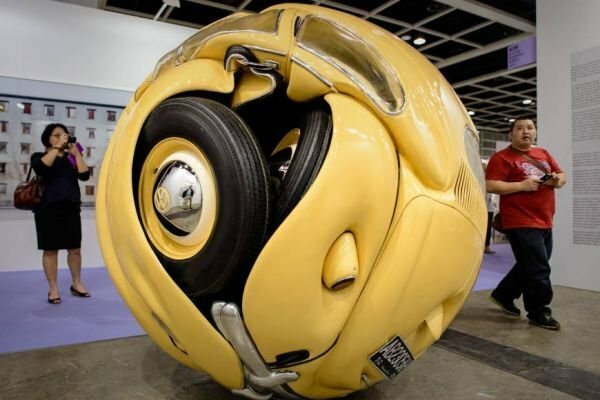 He created this Volkswagen sphere that is 1.8 meters across out of the parts of actual Volkswagen Beetle. The sculpture’s visual form yields an impression of a sphere – the basis of all forms. The shape of a car is pressed onto the spherical form, producing a dynamic movement, a certain flexibility, but also fragility. It is a concept of “totems” that is embraced/believed by the people of today. Or maybe it’s just cool because someone crushed a car into a ball and it looks like Bumblebee. Yeah, that’s why I like it. 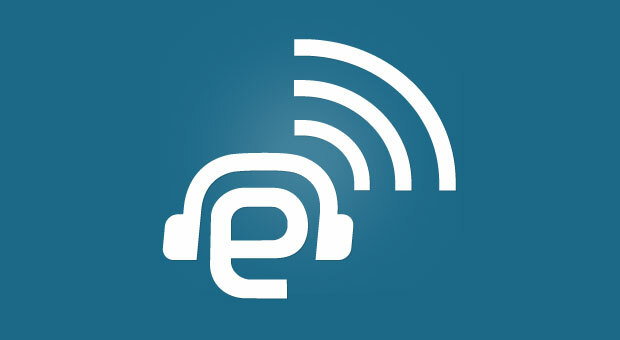 We weren't able to make into the studio again, but a week without a new episode of the Engadget Podcast is hardly a week at all, right? Tim's still a traveling man, but he finally picked up a PlayStation Vita for entertainment on the move. Tune in to find out if he likes it and get a recap of the week's tech news, including the tastiest tidbits from D11. Stream the audio below and find the video version embedded past the break. And then there were three. Bloomberg is reporting that a trio of companies are hoping to fork out over one billion dollars for the privilege of taking online video service Hulu under their wing, and DirecTV is one of them. While we're not quite sure which other companies are involved in the process, we've been told that Yahoo, Time Warner Cable and a few others have at least thrown out offers, with no confirmation on how much they were willing to spend. Although those "people with knowledge of the bid" could include a few hoping to encourage more $1b+ offers, those extra large checks increase the odds Hulu will actually sell this time. We're quietly hoping that this potential bidding war will be resolved through an arm wrestling match, though DirecTV's legal team likely wouldn't approve. We’ve seen plenty of nifty crocheted Star Wars items and I’m sure we will see more. 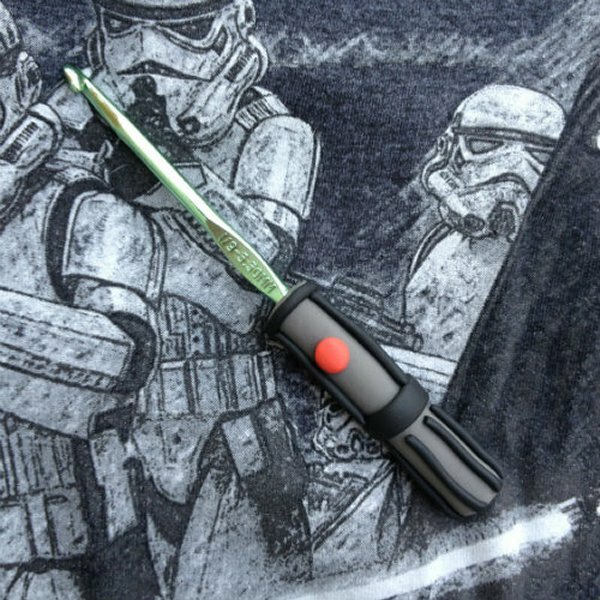 But a real Jedi Master crafter uses a weapon like this awesome lightsaber crochet hook. Imagine what you could create with this lightsaber. It’s an elegant crafting weapon for a more civilized age. These cool crafting implements are made by Cherelled and are just $15(USD). They are made from polymer clay. If you want to make one yourself, the tutorial for the grip can be found here. Craft or craft not. There is no try. 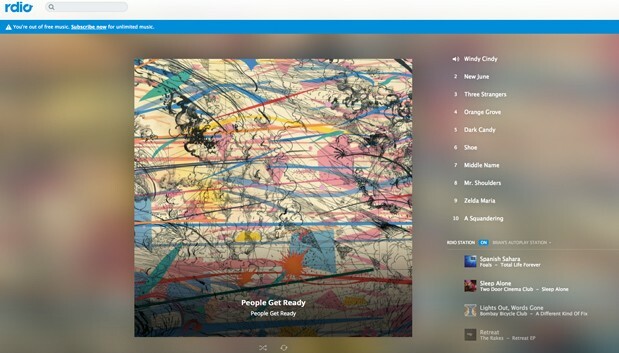 Social media streamer Rdio rolled out a major redesign a little over a year ago and has done a bit of tweaking since then. Now, following a recent update to its mobile apps, the service is making even more changes. At the top of the list are methods for getting social on the site, with friends from Twitter and Facebook hitting its front page, alongside their listening habits and influencers selected by the service. You can also check out a curated list of potential friends, if the front page just isn't doing it for you. Autoplay, meanwhile, creates personalized stations and keeps the music going after you're out of ideas, or you can proactively create stations by clicking on album artwork. Also new is a thumbs up / thumbs down voting feature and a full-size player featuring big album artwork and upcoming tracks. BMW and ASRock just announced the new M8 gaming PC, which will debut at Computex next week. 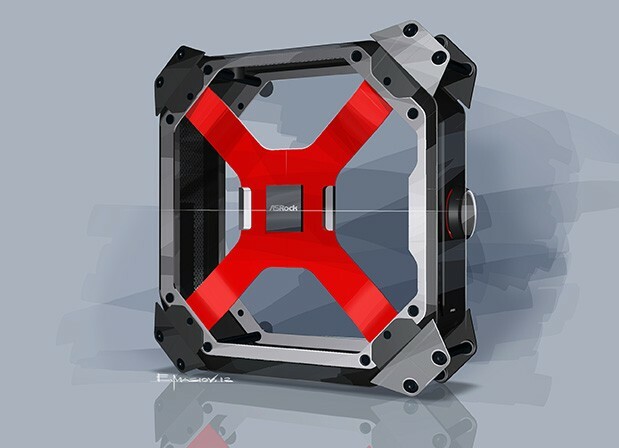 The collaboration is ASRock's first rig with a small form factor, though it shares the sharp lines and edgy color palette of the hulking, BMW-designed Thermaltake Level 10 case. An OLED screen sits on the front of the case and displays stats such as fan speed and temperature, and there's a knob for adjusting the fan depending on the game at hand. Interestingly, the M8's semi-transparent side panels are attached magnetically rather than screwed in, so users should have no trouble accessing components. So far, the companies have only shared connectivity specs: 802.11ac WiFi and Bluetooth 4.0 are on board, as is a quad-core Creative SoundCore 3D audio processor. We're bound to find out more in Taipei, though, so hang tight. 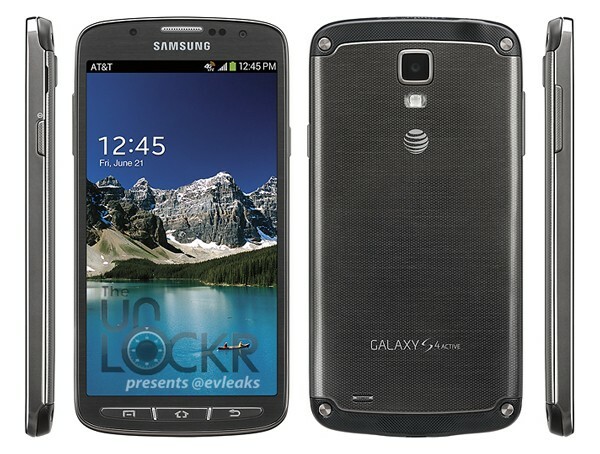 The Samsung Galaxy S 4 Active isn't really much of a secret at this point, despite the fact that it's still unannounced. It's already been seen in its share of images and videos, and the I537 -- the AT&T-branded version -- has even been spotted passing through the FCC. Fortunately, @evleaks dug up some imagery of this particular variant of the rugged smartphone in black (though it will supposedly be offered in teal as well), complete with the trademark AT&T globe on the back. It's rumored to offer a 1.9GHz quad-core Snapdragon 600 chipset, HD display, 8-megapixel rear camera and water-resistant protection. What's more, we're being told that this is just one of many Samsung devices on its way to the large GSM operator this year, accompanying the Galaxy S4 Mini, Galaxy S3 Mini (oddly), Galaxy Mega 6.3 and Galaxy Note 3. Pricing is still unknown, but we have to wonder if the date on the phone's display above is an indication of what we can expect to see at Samsung's June 20th event.